After decades spent traveling throughout Thailand, Andy Ricker wanted to bring the country's famed street food stateside. In 2005 he opened Pok Pok, so named for the sound a pestle makes when it strikes a clay mortar, in an old shack in a residential neighborhood of Portland, Oregon. Ricker's traditional take on Thai food soon drew the notice of the New York Times and Gourmet magazine, establishing him as a culinary star. Now, with his first cookbook, Ricker tackles head-on the myths that keep people from making Thai food at home: that it's too spicy for the American palate or too difficult to source ingredients. Ricker shares more than fifty of the most popular recipes from Thailand and his Pok Pok restaurants--ranging from Khao Soi Kai (Northern Thai curry noodle soup with chicken) to Som Tam Thai (Central Thai-style papaya salad) to Pok Pok's now-classic (and obsessed-over) Fish-Sauce Wings. But Pok Pok is more than just a collection of favorite recipes: it is also a master course in Thai cooking from one of the most passionate and knowledgeable authorities on the subject. Clearly written, impeccably tested recipes teach you how to source ingredients; master fundamental Thai cooking techniques and skills; understand flavor profiles that are unique to Southeast Asian cuisine; and combine various dishes to create show-stopping, well-balanced meals for family and friends. Filled with thoughtful, colorful essays about Ricker's travels and experiences, Pok Pok is not only a definitive resource for home cooks, but also a celebration of the rich history, vibrant culture, and unparalleled deliciousness of Thai food. "In this groundbreaking masterwork, Andy Ricker weaves together superb recipes, enlightening cultural narratives, meaningful personal essays, and an incomparable insight into the essence of Thai foodways. But perhaps this book's greatest achievement is the honest, uncompromising way it brings real Thai cookery right into American readers' homes. The bar has been set for ethnic cookbooks going forward." --Andrew Zimmern "Everything I know about Thai food I learned from Andy Ricker--how to order it, how to eat it, and now, how to cook it. Pok Pok is destined to be the Thai bible for every adventurous home cook. Part memoir, part cooking manifesto, it beautifully and passionately shows Ricker's no-nonsense approach to one of the world's most exciting cuisines. When my daughters ask why they grew up eating so much khao soi kai, papaya salad, and laap pet isaan at home, I'll tell them they have Andy Ricker--and this book--to thank. --Andrew Knowlton, restaurant and drink editor, Bon Appétit "More than a Thai cookbook or even a regional Thai cookbook, this is a book about people: the street and market vendors, home cooks, and restaurant owners who Andy Ricker has met and studied with for over two decades in Thailand. 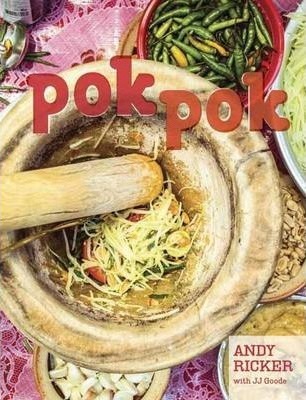 In Pok Pok, Andy shares their stories, skills, and ideas--and his own passion for discovering a cuisine by going door to door. Oh yeah, and he makes some insanely delicious food along the way." --Francis Lam, writer and judge on Top Chef Masters "You'd be hard-pressed to find better Thai food than what Andy Ricker is serving at Pok Pok. And now, with his cookbook, we finally get to see the people, places, and experiences that were the inspiration for it all." --David Chang, chef/owner of Momofuku "This book, as far as I'm concerned, is an argument ender. When Andy says 'make som tam lao like this, ' it's like Jacques Pépin telling you how to make an omelette. The matter is settled. Previously, I would never have even attempted to prepare most of these dishes in my home. I had always felt that Thai food was best left to the experts. But this book has given me hope and confidence." --Anthony Bourdain "In his introduction, Ricker makes the modest proclamation that his cooking knowledge is limited when measured against Thailand's vast cuisine. However, this limitation has had no visible effect on his success, given that his eatery, Pok Pok, was recently rated by Bon Appétit as the eighth most important American restaurant. All one really needs to know about Ricker, and this finely detailed cookbook and travelogue, comes at the start of his recipe for fish-sauce wings. Sounding like a gourmand Allen Ginsberg, he writes, "I've spent the better part of the last twenty years roaming around Thailand, cooking and recooking strange soups, beseeching street vendors for stir-fry tips, and trying to figure out how to reproduce obscure Thai products with American ingredients." He spills out his acquired knowledge here across 13 chapters and nearly 100 recipes. Lessons learned along the way include the beauty of blandness as exhibited in his flavor-balanced "bland soup" with glass noodles, and waste not, want not, as showcased in recipes for stewed pork knuckles and grilled pork neck. Ricker's prose, as aided by food writer Goode, is captivating, whether he is discussing America's obsession with sateh, or when profiling characters he's encountered in his travels, such as Mr. Lit, his "chicken mentor" and Sunny, his "go-to guy in Chiang Mai."